Written By: Peter Luzifer and Monolith. Image Work: Peter Luzifer and Douglas Mangum. In the Age of Apocalypse, Gideon was directly serving under Apocalypse himself as one his Horsemen. On the day Apocalypse declared war on humanity, he ordered his Horsemen to take control of the United States’ nuclear missiles arsenal at Cape Citadel. Whereas the other Horsemen were to fight off any resistance from the X-Men and the soldiers stationed at the base and later the X-Men, it was Gideon’s duty to hack into the base’s computer system and launch the missiles. 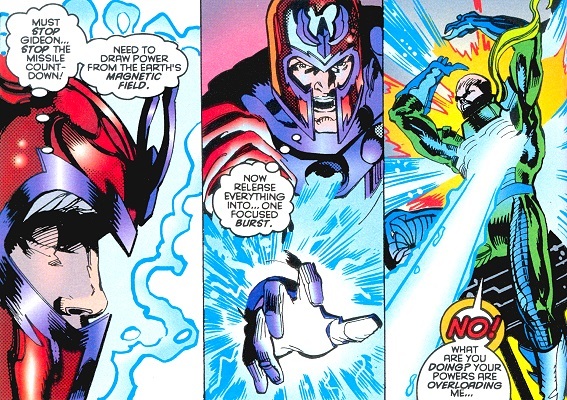 When Magneto tried opposing him, Gideon almost defeated even the master of magnetism with his own powers. Magneto turned out to be more resourceful, though, as he tapped into Earth’s magnetic field to overload Gideon’s powers, killing him. Gideon got to serve Apocalypse much longer in the reality depicted in What If (2nd series) #77, eventually outliving his master. In that timeline, Magneto had died an early death, leaving Xavier and the X-Men without any real challenge. As a result their dream for mutant coexistence prospered, yet, the X-Men also became lazy and no longer pushed themselves to the limit while honing their skills. Apocalypse used this to his advantage, secretly recruiting mutants to his cause of survival of the fittest. 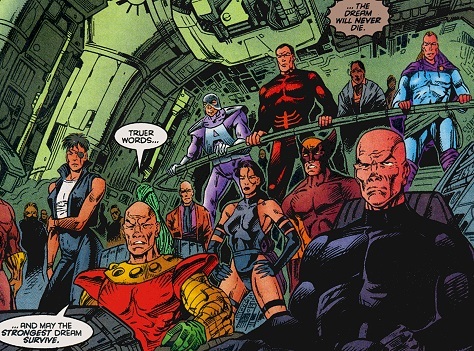 One of these mutants was Gideon, whom Apocalypse had infiltrate the Hellfire Club alongside Candra, to betray the potential rivals when they least expected it. Next, Apocalypse’s forces attacked the X-Men during a public event in Washington, D.C., and they certainly would have won if not for Jean Grey-Summers lashing out with the Phoenix Force. Although Xavier and Apocalypse both died during that conflict, they each had followers continuing their dreams. For Apocalypse’s cause of mutant supremacy, this turned out to be Gideon, who banded the likes of Callisto, Wolverine, Psylocke, Unus, Avalanche and the Vanisher around himself.